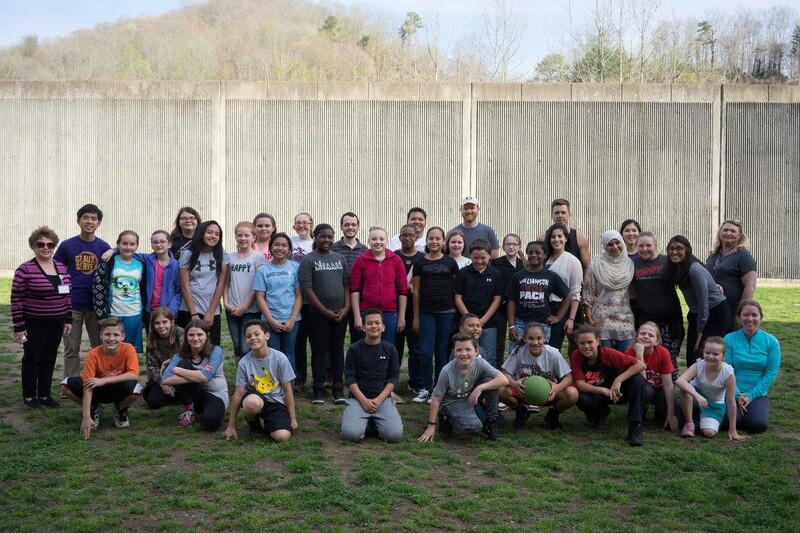 One highlight of the week included a kickball match we played with the students of Williamson PK-8 School. During the game, the kids told me how they started a fundraiser to build a new playground at their school. I also learned that the children are part of the 21st Century Learning Centers (CCLC) Youth Education Program and are taught to give back to the community as part of the curriculum. As a Fulbright Student from Hungary pursuing a Master of Arts in Philanthropic Studies at the Indiana University Lilly Family School of Philanthropy, I was intrigued that these kids, from their first day in school, are “learning by doing” how to be a committed fundraiser, a humble donor, or a responsible recipient. These children and their educators became a real inspiration for me to believe that we can achieve great goals together; a valuable lesson I will take back to my Fulbright studies in philanthropy. At the end of the day we took a group picture to have a nice memory about this afternoon. That was their thank you note to us. 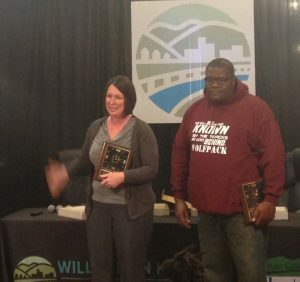 From left to right: Marlene and Nate, the recipients of the “Champion for Children” award for their advocacy in the community. Later in the week, a small community came together in Williamson, to celebrate those who have supported the local youth with mentorship, advocacy, or donations. Our group of Fulbrighters attended the “Champion for Children” award ceremony at the Mingo County Family Resource Network that honored the work of four everyday Williamson-local heroes: Marlene, Nate, Bob, and Jim. During the event, I realized this is the perfect way to practice stewardship and thank those who make a difference in the community. From my studies, I understand “it [stewardship] is a personal stance and attitude that defines an obligation to serve and take responsibility for all we have been given,” (Pribbenow, 1998, pg. 30). Stewardship is hard work. However, I have experienced that stewardship has always been present in Williamson. Our own group of Fulbrighters embraced the opportunity to practice stewardship and wrote thank you notes for all of the individuals and organizations that hosted us during the week. Sixteen thank you notes were prepared with different thoughts and often in different languages because of the diversity of our group. It was uplifting to witness the true appreciation of our group through the process of writing a thank you note to the Starr Family, one of the most wonderful and genuine couples I have ever met. The Starr Family hosted us on their farm and we were able to learn a great deal about beekeeping and also gain insights from their everyday life by listening to their personal stories, exploring family photos, and eating a homemade lunch. Their hospitality and their commitment towards their community reminded me of the importance of giving back to the community. Regardless of who you are, you can and should give back to your community and be thankful for your fellows’ endless work, too. 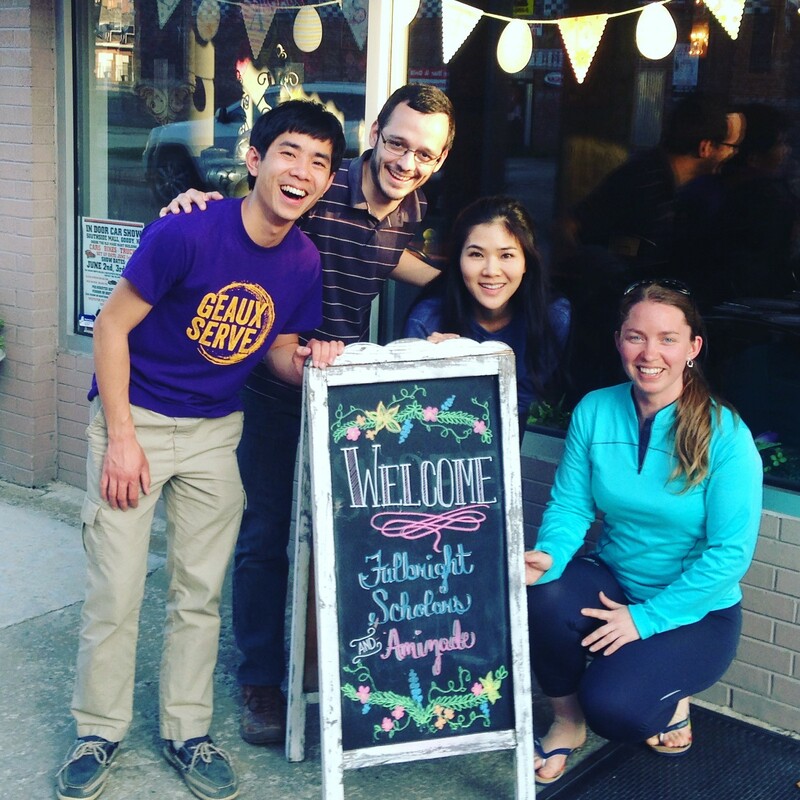 Snapshots from our week: building community gardens, visiting a local social enterprise focusing on regional economic and workforce development, creating a community place from an old, not-used building in Williamson. Experiencing the power of both community and philanthropy in Williamson, I witnessed how grassroots initiatives can lead to real changes in our society. I also learned that giving back is everyone’s responsibility whether we offer our time, talent, or treasure. Because of this experience, I am committed to building bridges between the students and our local community in Indianapolis by organizing service-learning opportunities for graduate students and promoting cooperation among student organizations as a Fulbrighter and as the president of the Philanthropic Studies Society at the Indiana University Lilly Family School of Philanthropy.